See more reviews from real people here, or Google "Matt The Balloon Man Reviews" to see for yourself! 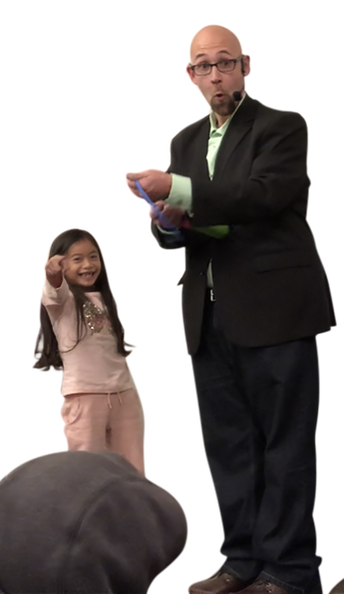 If you're planning a Blue and Gold ceremony and looking for a way to reward your scouts for all their hard work and dedication over the year, my family friendly magic show is a guaranteed way to do it! When I say "guaranteed," I mean it! Every show I do comes with a 100% MONEY BACK guarantee! I want you to hire me with confidence, so if your audience doesn't absolutely LOVE the show I will refund your money in full. Each show is a full length, 45 minute interactive magic show, and I bring all the equipment I need with me (including a professional sound system! ), making the event absolutely stress free for you. For most parts of New Haven, Hartford, and Middlesex Counties, the price for my Blue and Gold Magic Show is just $450! For more information, or to check availability, simply use the handy web form down below, or e-mail me at MattTheBalloonMan@gmail.com!